The qualities and attributes of mothers are an innate gift from a loving Heavenly Father. Women who become mothers by giving birth, through adoption, and women who do not have the opportunity to mother in this life, are all blessed with feminine qualities that contribute to Christ-like love and mothering. Strengthening and developing the desired characteristics and attributes of mothering takes time, even a lifetime. Qualities like kindness, empathy, love, and patience are given to women in a small, raw form with the expectation from Heavenly Father that we will live our lives in a way that will build up and strengthen our innate abilities. Life experience, setting and reaching goals, following Christ’s example, and simply growing older and maturing, all contribute to the development of these desired characteristics. But there is also one other way that women change into mothers, and that is through the chemical and hormonal changes their brains undergo during pregnancy and childbirth. 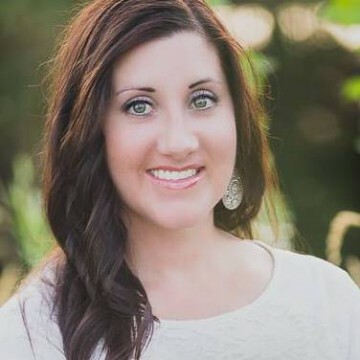 Rarely spoken of and understood by few, Heavenly Father created a physiological chain reaction to ignite a woman’s ability to love, nurture, and protect her children, and help her develop into a loving, strong, patient, and compassionate parent. I was pretty nervous to become a mother. Growing up I didn’t have any younger siblings, and was so involved in school and extra-curricular activities that I didn’t babysit much either. I remember quickly running out of patience during the times that I did babysit, and found myself easily annoyed by the tantrums and childhood antics of the children I was watching. In my late teen years I discussed this with my mom, and she told me it would be different when I had my own children. She claimed I would be more patient and enjoy them more. I found it very hard to believe. At just 23 years old, I prepared to give birth to my first child. The pregnancy was difficult, as most are. I was finishing up my degree and was always exhausted and sick to my stomach. I would run out of class just in time to throw up into the nearest trash can. My baby was literally making me sick day in and day out, and I was happy to bear that burden because it meant that I would have her in my arms someday. After years of complete selfishness and personal growth, I was willfully putting aside my own comfort for my child. I was becoming stronger, too, even though I didn’t know it. 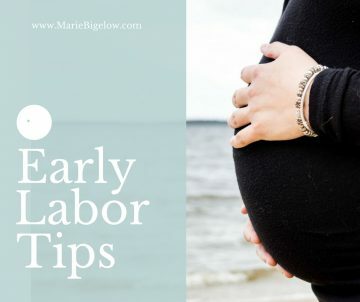 The longer I was pregnant, the more estrogen and progesterone my body made, increasing my pain tolerance and preparing me for the upcoming discomforts of labor. (1) Once labor would hit, my body would undergo many more chemical reactions that would help me bond with my daughter, love her intensely, and nurture her with empathy and patience. During labor and birth, I experienced a closeness to my baby and to my husband that I did not expect. Now I know those feelings were caused by the same hormone causing my contractions: oxytocin. Outside of childbirth, oxytocin is the hormone of love and bonding. Our brains create oxytocin when we have positive interactions with others. The more positive and consistent those interactions are, the more oxytocin our brain makes. This not only makes us happy in the moment, but assists in keeping long-term relationships strong. High and frequent amounts of oxytocin tell our brains how important someone is to us. If our brains were computers, oxytocin would be the code. During labor, oxytocin tells the uterus to have contractions and the brain to love, protect, and nurture the infant. Once the child is born, the mother’s brain experiences an oxytocin high, and creates more oxytocin than her brain will create at any other time in her life. This not only heightens initial bonding, but creates coding in the woman’s brain for a long-term relationship, even though the mother-child relationship is new. It also teaches us of God’s love for His daughters, His plan for birth to be joyful, and His desire for mothers and children to be intrinsically bonded. The heightened amounts estrogen from pregnancy also create oxytocin receptors in the mother’s brain, helping her maternal instincts go into overdrive directly after giving birth. This helps the early days of motherhood feel natural, even for a first-time mom. It helps a woman bond to her child, which will help her feel rewarded by taking care of her child, instead of resentful. (2) It also brings out her protective nature, and keeps her alert to anger dangers that may threaten her child. 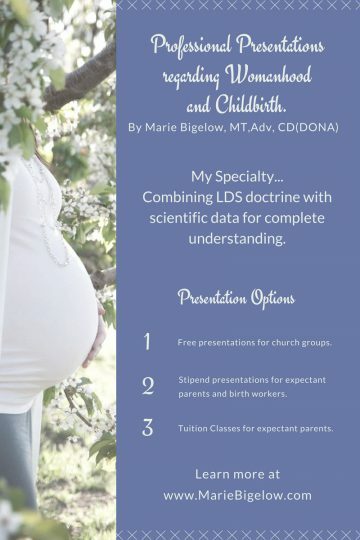 We often hear women claiming to have “pregnancy brain” or “mommy brain”. 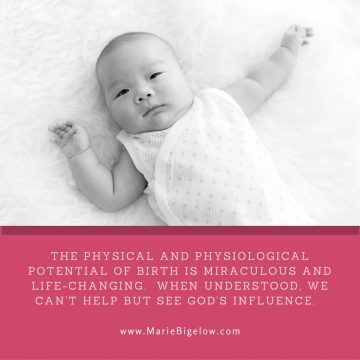 While the fatigue of motherhood can definitely contribute to a woman feeling foggy, the physiological firework session that women experience after giving birth actually increases their brain power. Neuroscientists have determined that the chemical components of pregnancy and childbirth increase a mother’s long-term memory, motivation, empathy, multitasking abilities and prioritizing skills! (3) They also decrease a woman’s fear, giving her the courage to do whatever it takes to keep her family safe. When we consider the miracle of birth, we are typically only considering the birth of the child. But the physiological aspect of birth is the birth of a mother. It is how Heavenly Father helps turn our potential into practice. “Hormones Driving Labor and Birth,” Childbirth Connection, Apr. 2011. 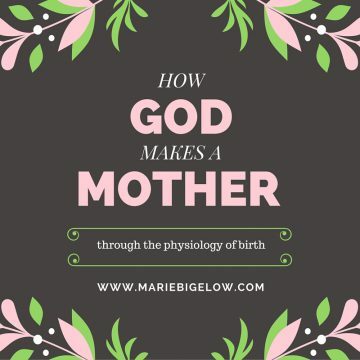 Written by Marie Bigelow, author of “The Sacred Gift of Childbirth”. If you liked this article, you’ll love the book!